Roll into William Hill Bingo, a premium online bingo site for 2017! William Hill Bingo has fast become one of the most recognized online bingo brands around. The site has been through a few fresh revamps, and now offers a stunning new interface with optimized design and fun features. Players can expect unstoppable entertainment, the newest games and incredible promotions. 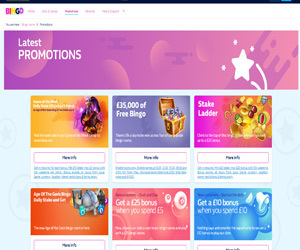 The online bingo community is also booming, with mega prizes being doled out every day! When you sign up to William Hill and deposit your first tenner, you can take advantage of £25 welcome bonus. The site is full to the brim with rewarding promotions and perks. For example, Bingo Special Hours, Penny games and Free Bingo games. There are actually far too many promotions to list everything. So you should really sign in and check these out for yourself. The promos change constantly and the incentives and bonuses are always getting better and better! William Hill Bingo showcases some of the greatest bingo games around. slot games around! The different kinds of bingo at William Hill include 90 ball, 80 ball, 75 ball, 75 ball pattern bingo. You can also find multi-variant bingo and Joker Jackpot. In addition. there are loads of instant and slot games available. These include Deal or No Deal, Fluffy Favourites, Sugar Train Slots, Pink Panther and Leprechaun's Luck. Other kinds of instant games include arcade games, scratchcards, number games and Vegas games. The games selection at William Hill Bingo is absolutely massive, certainly one of the largest available on any bingo site. There is no shortage of entertainment and your options for gaming are practically limitless. William Hill Bingo Mobile offers players exclusive bonuses only available on the mobile site. Additionally, players can also claim £25 New Player Bonus directly via the app or mobile site. 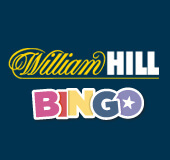 The William Hill Bingo mobile app is compatible with Android Smartphones and iPhones.